We’re an iPhone application. Last week while I was away, Federal News Radio launched the Federal News Radio iPhone application. And it is pretty cool. And it is free! Based in Washington, DC (1500 AM), Federal News Radio covers the business of the federal government by looking at lessons learned and best practices, and talking to the people themselves who make government work, including federal policy makers and contractors. Federal News Radio covers issues including management, technology, pay and benefits, contracting, and policy. Whether you work for the federal government or a federal contractor, Federal News Radio will provide you information that will help you do your job better. For more information on Federal News Radio go to FederalNewsRadio.com. This is particularly cool because you can now get the DorobekINSIDER right on your iPhone, but you can also listen to Federal News Radio 1500 AM even when you’re outside of our signal area. I might mention that our sister station, DC’s WTOP radio, also has a iPhone application — the “Glass Enclosed Nerve App.” Using that app, just like with the Federal News Radio app, you can use it to listen to WTOP. But you can also get weather and traffic — including big traffic issues and traffic cameras. Find that application here. Of course, an iPhone or iTouch is required to make the applications work. 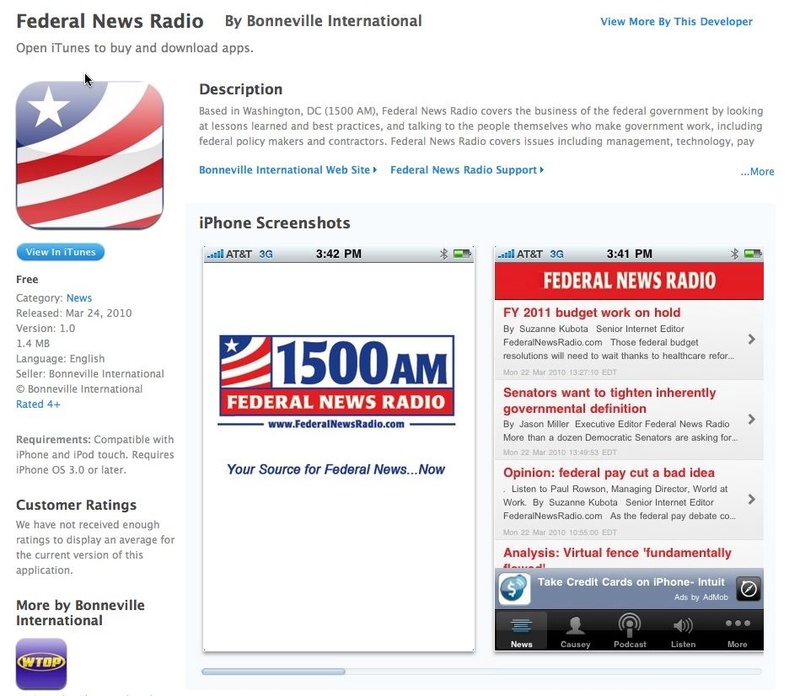 If you don’t have an iPhone or iTouch, FederalNewsRadio.com — and WTOP.com, for that matter — have improved the way we stream the stations from the Web sites. On the heels of our new iPhone apps, I wanted to make everyone aware of some other changes we have implanted to our sites. If you go to our Listen Live pages on either site, you will notice a greater selection of listening options. We have eliminated the Silverlight player and replaced it with a Flash Player. You can also still listen via Windows Media as well as Mp.3/iTtunes. Hopefully these changes can help us solve some of our technical issues that have blocked our streaming in the past.